We did our walk yesterday - 30 km in all - so I think sitting in front of the computer is the best thing I can do with myself today! 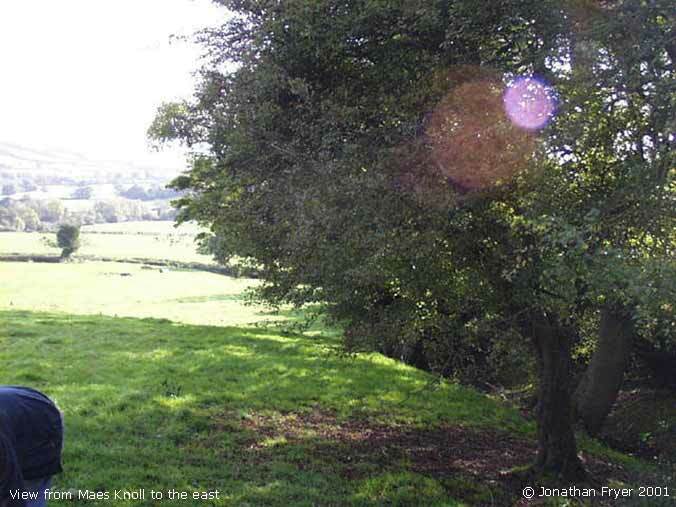 We walked up to Maes Knoll from Whitchurch - there's a network of footpaths in the fields SW of the church there, past 'Whitewood Farm' and then picked up Wansdyke just below the fort perimeter. 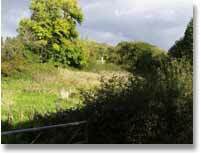 The ditch and bank are crowned by a hedgerow but are quite clearly visible, especially nearest the fort top where the ditch is maybe 2 metres deep. That's not strictly speaking on a right of way of course, but it may well be walked regularly by the locals, anyhow - there doesn't seem to be too much concern with heavy duty fencing of the field boundaries. I believe that if a route has been walked regularly unchallenged for a set number of years it's legally possible to claim it as a right of way. Anyway this is the view looking down Wansdyke from near the fort perimeter- there was a nice view of Stantonbury in the distance but the sunlight's faded it out I'm afraid. I knew I should have put the camera batteries on charge the night before too - they ran out after this - but I did have my 35mm along as well so I took a few shots of Maes Knoll and Stanton with that until I could pick up some more batteries in Pensford. We walked up to the main bank on the Knoll and picked up the waymarked path from there. What a beautiful day - I used to live in Bristol but I think the only time I've been up to Maes Knoll before was just after my first son was born and thats 22 years ago now! A lovely walk along the top and then into Norton Malreward, on down to Stanton Drew and along the River Chew to Pensford. 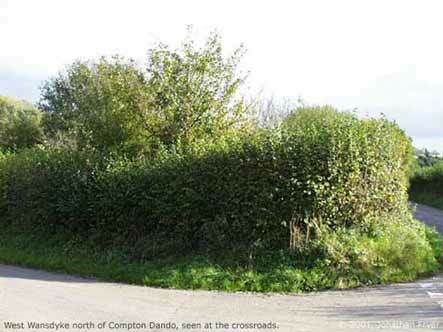 The next shot is also taken from the crossroads above Compton (looking east), where Wansdyke is marked as a feature. 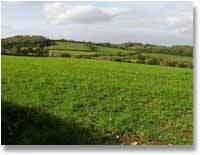 It's not obvious from the shot but the dyke shows as a very shallow bank in the foreground of the next photo. 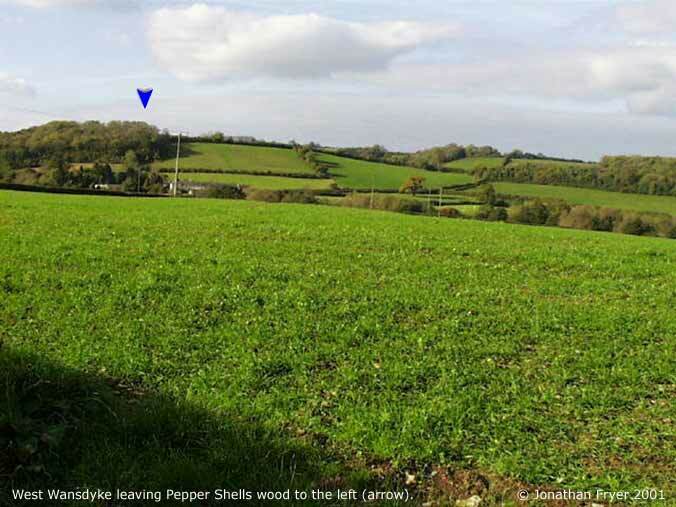 Shortly after this it looks as if the dyke and the road part company around the beginning of Glebe Wood - there's a field boundary which runs NE away from the road which resolves itself into Wansdyke about 1/2 km NW of Stantonbury. 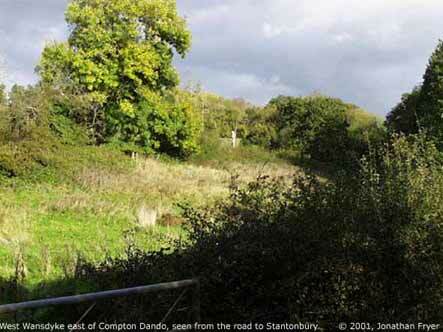 This is a pic of Stantonbury taken from the track just above Compton Dando. Time didn't allow us to go up to the camp (we don't walk as fast as we used to I suspect!! - I'll do that another day) and we needed to push on to get to Stoney Littleton before dark. So we crossed the A39 and took the lane to the south of the fort and then down into Stanton Prior and on to Priston both well south of the line of the dyke. One final impression tho of the area as a whole is how the greater Avon Valley forms a geographical boundary - we were in bright sunshine most of the day but there was a bank of cloud lying over the Avon and the hills beyond it all day. 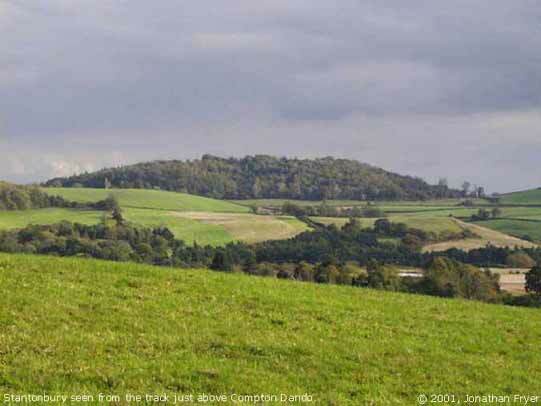 You can see right across to Bath and the Hills beyond and the Hill Forts at North Down and Solisbury Hill - I think it must have been a frontier many times. The land to the south of the dyke is a series of small valleys and ridges, after about 8 km we got to the town of Peasedown St. John. There's more than one Duchy of Cornwall farm round there too- they all display heraldic shields with gold dots on a black background! The Stoney Littleton Long Barrow is a Cotswold Severn chambered tomb probably dating back to around 3000BC. Its recently been restored and its possible to enter it if you arent too claustrophobic!, theres a low passageway connecting three pairs of bays and a terminal one, extending maybe 10 metres into the mound. The Neolithic people seem to have liked to visit their ancestors and sort through their bones - we didnt go that far and anyway the bones are long gone but it felt very appropriate to visit at nightfall on the edge of winter - we had a splendid sunset - and a fine ending to a great walk!